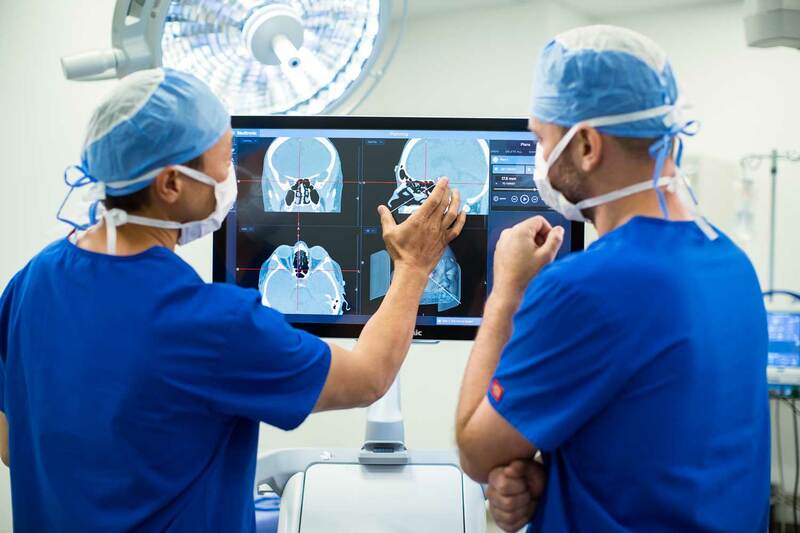 DUBLIN - September 12, 2017 - Medtronic plc (NYSE: MDT) today announced the global launch of the StealthStation(TM) ENT, a new surgical navigation system designed for surgeons treating conditions within the ear, nose, and throat (ENT) anatomy. The company has received U.S. Food and Drug Administration 510k clearance and CE (Conformité Européenne) Mark for the system. StealthStation ENT uses a proprietary electromagnetic (EM) tracking technology. It works by generating an electromagnetic field around the target patient anatomy during surgery so that instrument positioning is dynamically tracked throughout a procedure, similar to a GPS system for cars. "The intraoperative use of computer-aided surgery is very helpful to assist the surgeon in clarifying complex anatomy during sinus and skull base surgery," said Joseph Raviv, M.D., director of Endoscopic Sinus and Skull Base Surgery at NorthShore University HealthSystem in Chicago. "It provides an added level of assurance and may allow for a more thorough sinus procedure." The StealthStation ENT system provides enhanced visualization to surgeons and also offers new software and hardware innovations including Virtual Endoscopy, which provides a simulated view of sinus cavities previously inaccessible with a traditional endoscope. Virtual Endoscopy can be loaded with the patient's preoperative data to allow the surgeon to practice an individual's surgery before he or she enters the surgical suite. "Our goal is to improve outcomes for ENT patients by delivering innovative, market-leading products and solutions," said Vince Racano, vice president and general manager of Medtronic's ENT business unit, which is part of the Restorative Therapies Group. "StealthStation ENT is one of the ways Medtronic continues to expand the boundaries of what's possible with ENT navigation." To support operating room efficiency, StealthStation ENT features include an emitter that can be placed under the patient's head - allowing more space for personnel around the table - and a 27-inch, high-resolution touchscreen with an intuitive user interface that can be tailored by the surgeon.